Amongst all the bigger announcements were some smaller things. For example, Sigma is producing splash proof telecenters (TC-1401 at US$349 and TC-2001 at US$399) and a set of filters (water-repellant, UV, Circular PL) that will be available in October. Nikon meanwhile announced an SB-500 Speedlight (US$250) that will be available later this month, and which apparently replaces the SB-400. 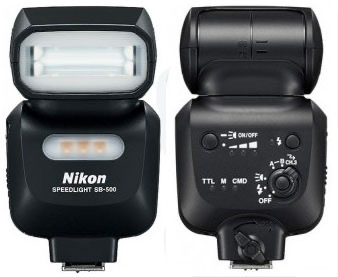 Besides the usual tilting flash head, the SB-500 has an additional front facing 100 lux (at 1m) LED light for video and close-up work (and modeling). Best news, though, is that it can perform as a wireless commander or remote. Nikon also joined the selfie parade with the Coolpix S6900, which has a swivel LCD and a built-in camera stand. Apparently we’re not into selfies here in the US, as NikonUSA doesn’t seem to be importing it (yet ;~). So, of the 54 current Nikkors that take front filters, 10 of them can use this new accessory. It’s telling which ones those are: 35mm DX, 40mm DX, 85mm DX, 18-55mm DX, 55-200mm DX, plus the older 24mm f/2.8, 28mm f/2.8, 35mm f/2, 50mm f/1.4D, 50mm f/1.8G FX primes. Had Nikon come out with a 62mm and 77mm Close Up lens and supplied them with 52-62mm step up and 72-77mm step-up rings, respectively, they could have claimed compatibility with 42 Nikkors. Just goes to show you how Nikon’s decision making is going these days. But, hey, it’s basically something for the DX crowd, right?